PF-573228 is an ATP-competitive inhibitor of FAK with IC50 of 4 nM in a cell-free assay, ~50- to 250-fold selective for FAK than Pyk2, CDK1/7 and GSK-3β. FAK inhibition blunted the increased migration induced by PGC1α depletion. G361 cells were subjected to 24 h transwell migration assays in the presence of DMSO or various doses of FAK inhibitor PF-573228. Images represent three pictures captured with scale bar representing 100 μm. Nature, 2016, 537(7620):422-429.. PF-573228 purchased from Selleck. (b) Using PF-573228 at a concentration range of 0.01–10 μM for 24 hours decreased phosphorylated FAK expression in a time-dependent manner, and there was a 70% inhibition rate at the range of 5–10 μM. Sci Rep, 2017, 7:43146. PF-573228 purchased from Selleck. Vascul Pharmacol, 2018, doi:10.1016/j.vph.2018.06.017. PF-573228 purchased from Selleck. Cell Oncol (Dordr), 2017, 40(1):47-62.. PF-573228 purchased from Selleck. OVISE cells were incubated for 25 hr at the indicated concentrations of the FAK inhibitors. Immunoblots were performed to assess inhibition of auto-phosphorylation by the FAK inhibitors. PLoS One 2014 9(2), e88588. PF-573228 purchased from Selleck. 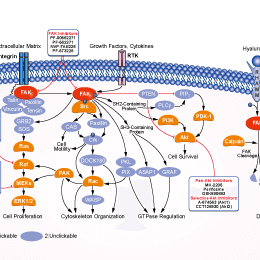 Cell growth inhibition of non-small cell lung carcinoma (NSCLC) by Focal adhesion kinase (FAK) inhibitor PF-573228. PF-573228 was applied on NCI-H460 and COR-L23, both derived from large cell lung carcinoma. Hence, it acted similarly showing strong inhibitory potential in both cell lines by suppressing the growth of 50% of cells between 4 and 7 礛. 2014 Dr.Milica Pesic from Institute for Biological Research. PF-573228 purchased from Selleck. Inhibition of FAK by PF-573,228 in Ctrl-MT mice leads to a significant suppression of mammary tumorigenesis as well as lung metastasis. In contrast, treatment of MFCKO-MT mice with PF-573,228 did not affect the initiation of mammary tumors in these mice, as would be expected due to the absence of FAK in mammary epithelial cells of these mice . Growth assays are performed by seeding 1 × 104 REF52 or PC3 cells/well of a 24-well plate in triplicate 24 h prior to daily treatment with the indicated concentrations of each inhibitor for 3 days. Subsequently, the cells are harvested and counted. Slack-Davis JK, et al. J Biol Chem, 2007, 282(20), 14845-14852. Fan H, et al. J Biol Chem. 2011, 286(21):18573-82. Would you please let me know the detail of how to dissolve PF-573228 (Catalog No.S2013) for in vivo study (oral administration)? PF-573228 in 30% PEG400+0.5% Tween80+ 5% Propylene glycol at 30mg/ml is a suspension. If you will use the compound for oral gavage, this suspension is fine for it. PND-1186 (VS-4718) is a reversible and selective FAK inhibitor with IC50 of 1.5 nM. Phase 1. PF-431396 is a dual PYK2/FAK inhibitor with IC50 of 11 nM and 2 nM, respectively. PF-00562271 Besylate is the benzenesulfonate salt of PF-562271, which is a potent, ATP-competitive, reversible inhibitor of FAK with IC50 of 1.5 nM, ~10-fold less potent for Pyk2 than FAK and >100-fold selectivity against other protein kinases, except for some CDKs. Phase 1. 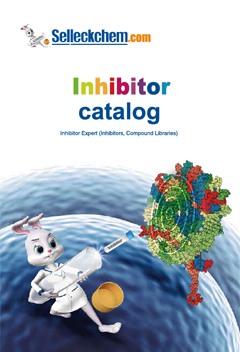 TAE226 (NVP-TAE226) is a potent FAK inhibitor with IC50 of 5.5 nM and modestly potent to Pyk2, ~10- to 100-fold less potent against InsR, IGF-1R, ALK, and c-Met. PF-562271 is a potent, ATP-competitive, reversible inhibitor of FAK with IC50 of 1.5 nM in cell-free assays, ~10-fold less potent for Pyk2 than FAK and >100-fold selectivity against other protein kinases, except for some CDKs. PF-562271 HCl is the hydrochloride salt of PF-562271, which is a potent, ATP-competitive, reversible inhibitor of FAK with IC50 of 1.5 nM, ~10-fold less potent for Pyk2 than FAK and >100-fold selectivity against other protein kinases, except for some CDKs. Phase 1.